This is a small program that I wrote while working on something else - for whatever reason I needed information on the length of the average keystroke. 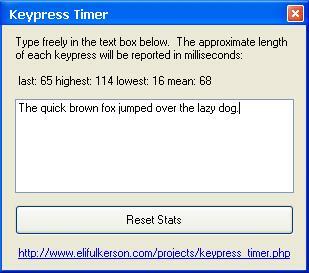 This program measures your output as you type into a text box, reporting the fastest, slowest, and average time between the key going down and the key going back up again. Win32. You will need the .NET runtime if you don't already have it.